Could the N64's GoldenEye 007 finally be coming back after all? As spotted by superannuation, an animator named Craig Peck was working on a project called GoldenEye 2010 for the Nintendo Wii during his time at Eurocom Entertainment Software from July 2009 to September 2009. The site picked this up from Peck's resume, which appears to now have been taken down. What this could be, if anything, can only be guessed at, but one possibility is that a remake of GoldenEye 007 for the N64 could be coming to the Wii sometime in 2010. Over a year ago, legal issues associated with the re-release of GoldenEye 007 were highlighted, mostly due to licensing problems. If these have been worked out, Bond could live again on the Wii. Peck's resume gave no clue as to what GoldenEye 2010 is other than its name, so for all we know it could have something to do with GoldenEye: Rogue Agent. Logic dictates that GoldenEye 2010 would have some association with GoldenEye 007, considering the N64 game's popularity and status as a classic. GoldenEye 007 was a 1997 first person shooter developed by Rare that in its time was an incredible experience. N64 owners could play four-player split-screen deathmatch with a variety of characters, maps, and modes, making GoldenEye 007 one of the most memorable multiplayer games of all time. The single player game was just as engaging, providing multiple difficulty settings that not only changed enemy difficulty, but also mission objectives. 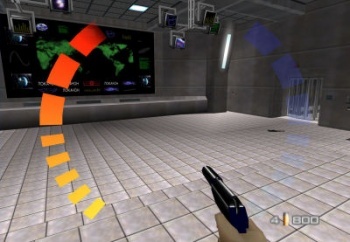 GoldenEye 007 also had a time-attack-like system that allowed players to unlock cheats (infinite ammo, invincibility, etc) for completing levels under a certain amount of time. If GoldenEye 2010 turns out to be nothing at all, do not be disappointed. The N64 version of Perfect Dark, the spiritual successor to GoldenEye 007 is being remade for Xbox Live Arcade, and though it didn't receive the attention of GoldenEye, multiplayer-wise it did so much more. More modes were added, along with different kinds of weapons, and you could even add bots into the mix. If you have fond memories of GoldenEye, and haven't tried Perfect Dark, you owe it to yourself to try the XBLA remake, currently scheduled to release in Winter 2009. Would the Wii really be the best place for GoldenEye 007 anyway, at least from an online multiplayer perspective?